EXPERIENCE FULL HD - Observe high-quality footage with the latest Sony image sensor, Ambarella chipset and superior HD 1080p with this wireless camera. A wide 90° angle allows you to see more detail and cover more ground to keep more of what you love safe. 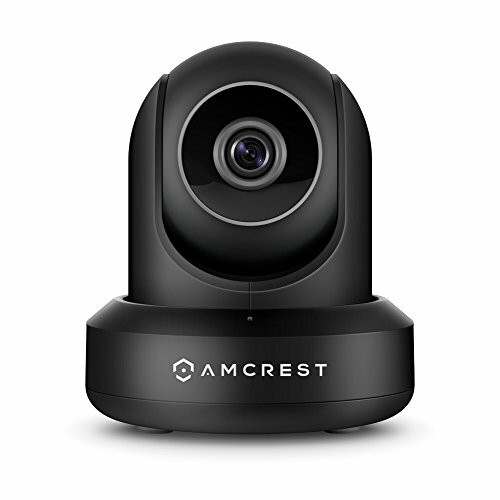 SMARTER, SAFER SECURITY - Receive intelligent alerts from your security camera to your PC or smartphone via the Amcrest View app. Record events as soon as they happen and store them on a NVR, Synology, QNAP, NAS, FTP, Blue Iris or Amcrest Cloud. ALWAYS RESILIENT - This IP camera offers remote pan/tilt with intelligent digital zoom to help you get an even closer look With IR LED night-vision up to 32 feet, you can keep the people and places you love safe 24/7. FIND SOLACE IN THE CLOUD - Amcrest Cloud was created to ensure that you don't miss a thing, no matter where you are. With an intuitive interface, you are able to live-stream your footage which enables you to play it back based on your preferences. SIMPLE. RELIABLE. SECURE. - At Amcrest, we want to ensure the safety of our customers, their loved ones, homes, and businesses. You'll receive a full 1-year US Warranty and Lifetime Support provided directly from Amcrest.